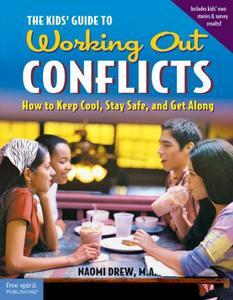 Naomi Drew M.A., "The Kids' Guide to Working Out Conflicts: How to Keep Cool, Stay Safe, and Get Along"
From taunts and teasing to physical assault, many kids face difficult, even dangerous situations at school, at home, and in the community. How can they avoid conflict and defuse tough situations? Written by a well-known expert on conflict resolution and peacemaking, incorporating the results of a nationwide survey of kids ages 10–15, this book offers practical, realistic answers. Author Naomi Drew describes common forms of conflict, the reasons behind conflicts, and positive ways to deal with difficult circumstances. Through self-tests and exercises, young people discover whether they are conflict-solvers or conflict-makers. They learn how to stand up for themselves without getting physical, and how to deal with people who don’t want to resolve conflicts in a peaceful way. Includes tips for countering bullying, calming down, lessening stress and tension, letting go of anger and resentment, and eliminating put-downs and other hurtful language.